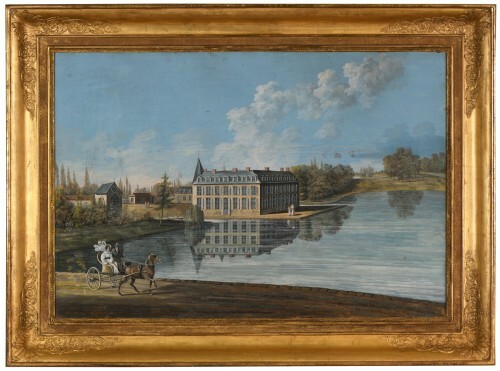 Exhibition: Salon de 1833, under number 2140, titled "Vue d’après nature, faite à La Celle Saint-Cloud"
Our painting is one of two views of La Celle Saint-Cloud that Sarazin de Belmont (then domiciled at 11 rue Saint-Germain des Prés) exhibited at the Paris Salon of 1833, which opened on March 1; the artist presented seven other works, including several views of Italy (including fixed under glass), a view of the castle of Pau and a series of lithographs views of the Pyrenees. 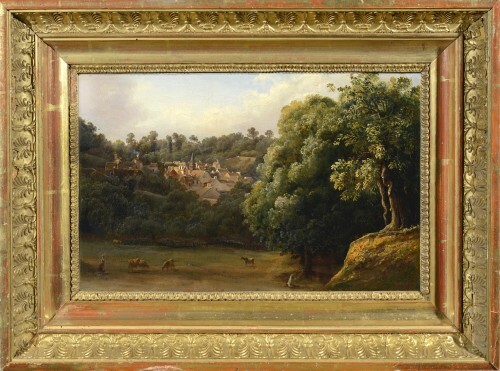 This view is possibly that which appeared in the collection of Baron Gros (View of the village of La Celle Saint-Cloud, N ° 10 of the catalog of his sale after death, which took place in his workshop on November 23, 1835); Gros held a good friendship and much esteemed Louis-Josephine, of whom he also possessed a view of the Pyrenees and another of Fontainebleau. 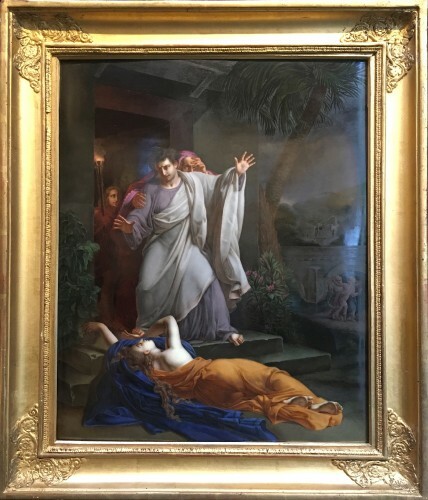 Sarazin de Belmont had a very long career as a landscape painter, with participations in the Salon from 1812 to 1868. His training with Valenciennes gave him a taste for small-format sketches made on the motif and also explains the rather "neo" atmosphere. 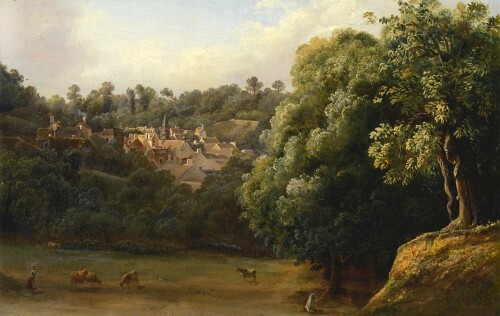 classic of most of his paintings; however, she did not apply strictly the principle of landscape "recomposed" in the studio, and included in her works a good dose of naturalism. 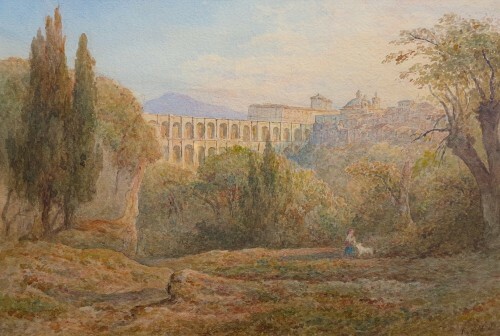 She excelled particularly in the rendering of light and its variations, and in the realization of the backgrounds (which makes that many of his paintings, especially the views of Italy, may recall Claude Gelée, said the Lorrain); it is true that in our painting it is this part which is the strong point of the work. 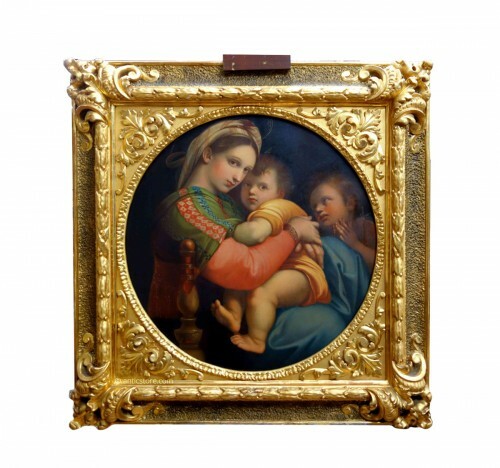 Very appreciated by her male colleagues (Gros can be added Ingres), she was also great collectors of the time: Josephine granted her protection and the Duchess of Berry had at least twelve of his landscapes. 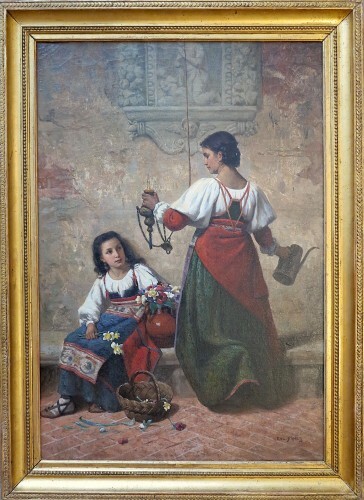 Sarazin de Belmont settled in Italy between 1841 and 1865, but traveled to other European countries such as Germany, and also traveled several French regions. Our painting belongs to the group of landscapes around Paris that she painted after returning from her important Pyrenean stay of 1830/1831. Close to her native city of Versailles, La Celle Saint-Cloud had its moment of glory in the middle of the 18th century, when Madame de Pompadour owned a domain (now owned by the Ministry of Foreign Affairs); at the beginning of the nineteenth century, it was part of the "rustic" destinations of Parisian artists, and then housed only about 350 inhabitants. The place served as a setting for several paintings exhibited at the Salon between 1835 and 1845, including a view taken in the chestnut woods of La Celle Saint-Cloud by Benouville in 1835. It seems, moreover, that the trees to the right of our composition are chestnut trees. We recognize in the village center the bell tower of the Saint-Pierre Saint-Paul church.